I looked at the time and realised the afternoon had flown by, my wife would be leaving work soon. I was just about to put the kettle on when I spotted she was still in work. How did I know? It was obvious from my WhereDial. I started to worry that we’d be eating late but the dial started moving and came to rest on “Travelling”. Not such a late one after all. I’d learnt the pattern a long while ago. It would tick round to “Station”, back to “Travelling” and then once it hit “Station” again it was time to put the kettle on as she’d be through the door shortly after. This might sound like an odd story if you’ve never come across the WhereDial but a story similar to this has been playing out for me since I came up with the idea for the WhereDial. 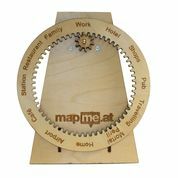 The original concept came about when I was working to promote my life mapping site MapMe.At and attended an Arduino hack day – Howduino – in Liverpool. I couldn’t think of anything to make and someone suggested I make a location clock “like in the Harry Potter books”. 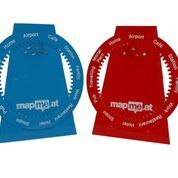 During the event I managed to get something basic working and eventually got a functioning clock working that would connect to MapMe.at, find out my location and update its hands to show where I was. I blogged about the clock and pictures of it have shown up at various conferences. People loved it and I was repeatedly asked if I would make another one to sell. That model was beset with problems though, the motor continuously broke and I cracked the glass on the face while building it so I realised this was never going to be something I could replicate and sell for a reasonable cost. A year ago I came across a clock made from laser cut wood with a dial with numbers on that rotated continuously to show the current time. 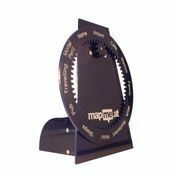 The ease of building and replicating this made me realise it was an ideal candidate for a reproducible and sellable version of the location clock, and so the WhereDial was born! Over the past year I’ve spent much of my spare time working with laser cutters, designing PCBs for a custom Arduino shield and writing and re-writing Arduino software. While there’s been various bumps in the road and it’s taken much longer than I’d hoped I’ve made some real progress. A key point was when at the end of August I finally ordered the PCBS, they turned up 2 weeks later and worked perfectly! So now we’re a year on in the project, where am I and most importantly will I be delivering WhereDials in time for Christmas? I’m happy to say the answer is – Yes! 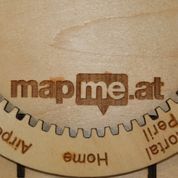 I added a basic shop onto the MapMe.At blog in the past few days and will start shipping orders early next week. UK orders should take just a few days to arrive but if you’re ordering from further afield, get your order in early if you want to have it by Christmas! 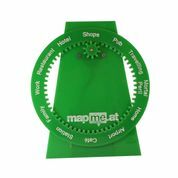 If you find the WhereDial interesting then keep an eye on its twitter account http://twitter.com/WhereDial or the MapMe.At blog for more information: http://blog.mapme.at/ – and if you want to order one, then head over to http://www.wheredial.com/. 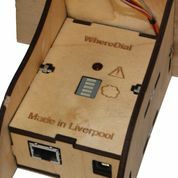 John McKerrell and friends will be exhibiting at MakerFaire UK on 27-28 April 2013 at the Centre for Life, Newcastle.